The current issue of African Security Review includes several papers that developed out of research from the World Peace Foundation’s African Peace Missions research program, directed by Mulugeta Gebehiwot Berhe. The articles in this issue are open access, and we will be posting key excerpts from each on this blog. Below is an excerpt from the introduction, “Peace missions and the security sector in Africa,” by Mulugeta Gebehiwot Berhe and Alex de Waal. 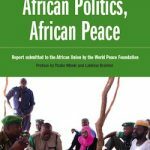 The African Peace Missions program culminated in a report submitted to the African Union, African Politics, African Peace, that charts an agenda for peace in Africa, focusing on how the African Union can implement its norms and use its instruments to prevent and resolve armed conflicts. This issue of the African Security Review is the product of a comprehensive review of peace missions in Africa, requested by the African Union Commissioner for Peace and Security and undertaken by the World Peace Foundation (WPF). World Peace Foundation, African Politics, African Peace.View all notes Part of the stimulus for the report was the establishment by the United Nations (UN) Secretary-General of the High-Level Independent Panel on Peace Operations (HIPPO) in late 2014, the first such high-level review of peace missions that had been undertaken since the Brahimi Report 15 years prior. Today, more than 80% of UN peacekeepers are deployed in Africa, and the African Union (AU) has grown to be a major partner in the full spectrum of peace missions, taking part in preventative action through conflict mediation to robust peace-enforcement operations. For these reasons, the AU felt it appropriate to commission its own independent review of peace missions, so as to better inform its policymaking process. Consequently, the WPF undertook a year-long research process, including eight case studies and twelve cross-cutting themes, as well as a series of consultations with scholars, policymakers and peacekeepers. The project was supported by the Danish Ministry of Foreign Affairs, the Swiss Ministry of Foreign Affairs, the Carnegie Corporation, and the WPF itself. The papers in this special issue are a subset of these, focusing especially on the topic of security sector reform (SSR), a component of the project specifically supported by a grant from the Carnegie Corporation of New York through the Institute of Human Security at the Fletcher School of Law and Diplomacy, Tufts University. By definition, peace operations are deployed in situations in which there is either ongoing or recently-concluded armed conflict, and therefore the legitimacy of the state and especially the national security sector are fiercely contested. The typical formula for an internationally-sponsored peace agreement includes components for SSR, as well as disarmament, demobilisation and reintegration (DDR). The success of any peace agreement depends crucially on these elements. The six papers in this collection focus on this challenge. Full essay available through African Security Review.